At the end of a rectangular place one can find the severe and fascinating front in Romanic Umbrian style, of the Cathedral of San Rufino. As it results from a rock, written in gothic characters and inserted on the wall at the back of the right nave, the building of the church started in 1140, the direct attribution is for the architect Giovanni da Gubbio. 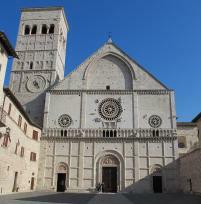 The church is aimed at hosting the remains of Bishop Martyr San Rufino, who predicted the gospel in Assisi during the first half of the IIIrd century and drown in the river Chiascio, it is the third church, in time order, dedicated to the Saint, after the small sacellum of the Vth century and the church of Ugone from the XIth century. The front is vertically divided by pilasters in three parts, corresponding to the three internal naves; horizontally in three zones delimitated by cornices with typical roman arches. In the inferior part, divided in three frames, are presents three portals with arches with lions and griffons. The campanile is the crown of the front, it is built on a robust roman foundation, made of large blocks in travertine. The was already a part of the church of Ugone, but it was smaller. The part over the cornice with squared archstones was built at the same time as the front, and is in perfect harmony with this last one. The windows of the belfry cage, are dominating four orders of small closed arches aimed at giving a slimmer aspect to the architectonic structure.